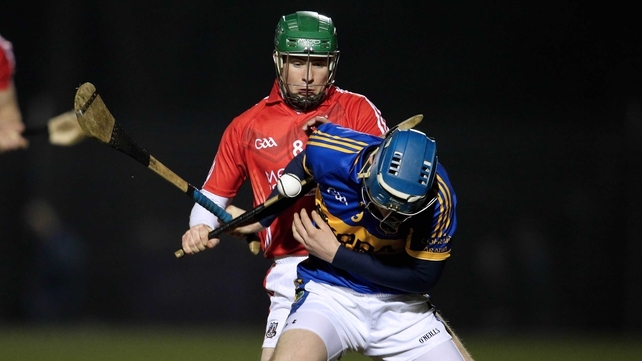 CORK hurling may have endured a turbulent enough winter but their next generation roared out a defiant message of intent with a 12-point demolition job of Tipperary at Páirc Uí Rinn last night. Coming into the game much was expected, too much perhaps, of Tipperary’s 2013 title aspirations under an impressive new management team. A late Eoin Kelly goal may have spared their blushes but only just. Long term, last night’s shock result may be no bad thing to temper expectations in the county. In contrast, Cork had to ride out player defections, retirements and some turbulence within the backroom but what they produced on their home turf was sensational, especially scintillating exhibits from Daniel Kearney, Patrick Horgan, Chris Joyce and Cian McCarthy. It was a sign of their deadly intent that with 12 points between the sides and just three minutes left Patrick Horgan opted to go for goal. But each player excelled in a game that was effectively over at the break as this young team, mostly bereft of underage All- Ireland medals and with only three hurlers over 25, delivered a text-book display to overwhelm their opponents. The genesis of this display came from the Cork forwards — they harassed and harried their opponents. Anytime it did reach the Cork defence the Tipp boys were out-fought and hassled to the extent that they were forced to shoot hurriedly and inevitably, wide. Although the game was totally one-sided before long, a sizeable crowd of around 6,381 was at least treated to a feisty opener with plenty of hard tackling and two yellow cards brandished by Barry Kelly in the opening minutes. A stream of frees from Patrick Horgan sent Cork into a commanding 0-5 – 0-1 lead as Cork, clearly with more hurling and fitness work behind them , put the foot to the floor and kept it there. Tipp’s only option was to lump it long to Brian O’Meara who worked hard but was left isolated more often than not. Chris Joyce looked like he had owned the number six shirt for years. He was pulling to the wings demanding short puckouts from Nash and mopping up at every opportunity. After 13 minutes he fired an incredible point to put Cork 0-7 – 0-1 ahead. Together with Daniel Kearney, Joyce was on fire. Tipp on the other hand were limp — they had five wides recorded before the first half ended, all of which were scoreable. Eamon O’Shea replaced Johnny Ryan and Seamus Callan with Adrian Ryan and Corbett as another flow of points from Luke O’Farrell, Stephen Moylan, William Egan and Cian McCarthy put Cork 12 points up at the break. Young Jason Forde was brought on at the break as Tipp racked up the yellow cards — they had four by the 37 th minute, but Cork ploughed on in ruthless fashion and extended their lead to 0-17 – 0-2. Super scores from Corbett and Forde left 13 points in it with 20 minutes to go and when O’Meara went off Tipp finally stopped going the direct route. But the overall template of the game didn’t alter much. Cork did ease up a little but had their mark more than made by the game’s ending. Tipp face Kilkenny in a fortnight’s time and it goes without saying that they can’t countenance another display like this. Still, it’s early days. There are five full months between February and August which for any serious contender is when the season really kicks off. For Cork, the danger is of peaking very early in the season. Will they be so razor sharp at the business end of the season? For the moment Jimmy Barry-Murphy won’t be one bit concerned about that — for him last night was the perfect opener after a tumultuous few months. Scorers — Cork: P Horgan (0-13, 10f), D Kearney (0-3), S Moylan (0-2), C Joyce (0-1), L O’Farrell (0-1), L McLoughlin (0- 1), C McCarthy (0-1), W Egan (0-1), P O’Sullivan (0-1), C Lehane (0-1), M Walsh (0-1). Tipperary: J O’Dwyer (0-3), N McGrath (0-3f), E Kelly (1-0), J Forde (0- 2), L Corbett (0-2), A Ryan (0-1), Cork: A Nash, S O’Neill, S McDonnell, C O’Sullivan, S White, C Joyce, W Egan, D Kearney, L McLoughlin, P O’Sullivan, C McCarthy, C Lehane, S Moylan, L O’Farrell, P Horgan. Subs: T Kenny for D Kearney (60), M Walsh for L McLoughlin (62), A Mannix for L O’Farrell (66) Tipperary: B Cummins, P Stapleton, P Curran, C O’Brien, D Maher, Paudie Maher, B Maher, S McGrath, J Ryan, S Callanan, N McGrath, Patrick Maher, S Bourke, B O’Meara, J O’Dwyer. Subs: A Ryan for J Ryan (25), L Corbett for S Callanan (31), J Forde for Patrick Maher (h/t), E Kelly for B O’Meara (45), M Cahill for P Stapleton (60). Patrick Horgan scored 13 points as Cork opened their Allianz Hurling League campaign with a 0-26 to 1-11 victory over Tipperary at Páirc Uí Rinn. Cork scored 14 points in the first half with Horgan, Daniel Kearney and Christopher Joyce impressing. Tipp improved in the second half wth substitutes Lar Corbett and Jason Forde doing well and Eoin Kelly grabbing a late goal. But the result was never in doubt with Paudie O’Sullivan and Luke O’Farrell among Cork’s 11 scorers. In front of 6,381 spectators, Jimmy Barry-Murphy’s side produced a performance that their Munster rivals found difficult to live with for long periods. Tipp were restricted to just two points in the first half, Noel McGrath scoring inside a minute and Johnny O’Dywer then registering in injury-time. In between, the hosts put 14 unanswered scores together, their all-round play outstanding, and while the second half was not as much of a procession, Cork still ended with 26 points and 11 different scorers, Horgan leading the way with 13 points. Cork’s success was built on the endless effort of midfielders Daniel Kearney and Lorcán McLoughlin, both of whom were excellent, while the defensive performance was epitomised by Conor O’Sullivan and William Egan. If Cork were to have any quibbles, it would be that they did not get a goal while Tipp did and that Stephen Moylan was the only starting forward apart from Horgan to get more than a point, but overall the Rebels will be delighted with the outcome. Some of the first half play was wonderful, with the ball usage of the highest order and extremely hard work shown to win back possession and frustrate Tipp’s efforts. The visitors could not get going at all, as evidenced by their usage of three substitutes by the start of the second half, though when Horgan (0-02) and Kearney extended Cork’s advantage to 0-17 to 0-02 soon after the restart, things looked very ominous. 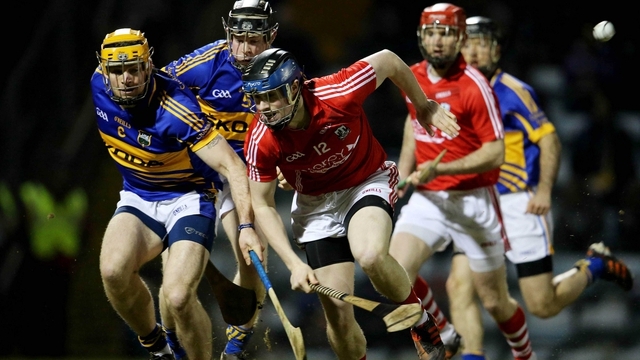 To give Tipp credit, substitutes Forde, Corbett and Adrian Ryan all did well, and Forde’s second point cut the gap to a comparatively small 11 points – 0-20 to 0-09 – as Cork tired following their first half exertions. A full-blown comeback was never a prospect though, and Horgan continued to convert frees for Cork to ensure they kept the scoreboard ticking over. Eoin Kelly, another Tipp sub, got a late goal but it was nothing more than window-dressing on the scoreboard.